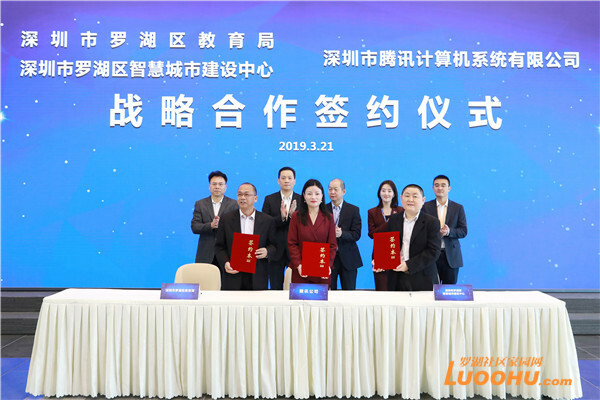 The government of Luohu district of Shenzhen city and Tencent Holdings Ltd. signed an agreement on March 21 to cooperate in the fields of digital government, healthcare, smart education, and scientific innovation, giving Luohu a boost in becoming "smarter" and more innovative. This year marks the 40th anniversary of the founding of Luohu district. Its mayor, Luo Yude, noted at the signing ceremony that the cooperation with Tencent will allow Luohu to strengthen its governance and speed up the smart building process. Leon Guo, senior vice president of Tencent, said he hoped such cooperation will empower intelligent industry in Luohu. With a big data-based education ecosystem expected in the near future, Luohu is taking the lead in exploring supply-side structural reform in education. Luohu district is forging ahead in smart development through a multi-sector cooperation agreement with Tencent.